If you’ve ridden the New York City subway, you know the feeling. You buy a flimsy plastic card that lets you ride the train, and when you try to swipe it at the turnstile, it doesn’t work. You swipe again. The machine asks you to swipe again. You swipe again. The machine asks you to swipe again at the same turnstile. This can go on for hours, until you beg an MTA employee to let you through. That’s the cursed MetroCard experience, and as of this week, its days are numbered. On Monday, the finance committee for New York’s Metropolitan Transit Authority approved a plan to phase out the MetroCard by 2023. The three-decade-old system is to be replaced by new technology that will enable riders to tap their phones or debit cards at the turnstiles, doing away with the often frustrating swiping situation as well as the iconic but easily lost yellow cards that have dominated public transit in New York City since 1993. This is not the first time that the MTA has attempted to evolve that system, but hopefully it’s the last. Cubic Transportation Systems, the company that won the contract to handle the transition, is the same company that designed the MetroCard setup in the early ‘90s as well as the more futuristic, touch-to-pay Oyster card for the London Underground on which the new MTA system will be based. In the end, the MTA’s switch will cost over $570 million. That’s a lot of money. Some of it will come from the fare hike that took effect in March of this year, and who knows if the MTA will raise them more in the future. Nevertheless, the death of the MetroCard is bound to improve—however slightly—the often frustrating experience that is a subway ride. Which is a tall order for New York City, a place often referred to as the home of the best public transportation system in the United States. It’s ironic that killing one of the subway’s most recent innovations is viewed as part of the solution for the system’s larger problems. Tokens worked well for a number of reasons, but key among them was the fact that the MTA could use the same turnstile technology for decades on end. The system was not without its flaws—perhaps most dramatically illustrated by the disgusting “token sucking” scam or the Great Token War of 1985—although it endured. The design of the tokens themselves varied slightly over the half century of their existence, but the experience largely remained the same for the riders. Then these forward-thinking technocrats came barging in with a new plan: the MetroCard. If you want to overgeneralize the decision to switch from tokens to the MetroCard, you should. The big reasons are obvious: data, data, and big data. While tokens were perfectly capable of providing a rough portrait of which stations were seeing the most traffic and which trains saw the most riders, it was hardly as granular as what a computer-powered system could offer. Just imagine how much more efficient the train and bus schedules would be if the MTA knew the exact location and time that every rider entered the station or boarded a bus. A computer thing could fix everything! Enter the MetroCard and its all-powerful magnetic strip. Designed by Cubic Transportation Systems and first tested in 1993, the swipe-based system not only provided the MTA with a record of each transaction, the cards themselves could also be written, rewritten, and verified in real-time. So when the rider swiped a MetroCard at a subway station, she left a trail of data both at the turnstile and on the magnetic strip of the physical card. The card could also store payment data, meaning many dollars’ worth of rides could be purchased at once, and then the value of the card would adjust with every swipe. On top of all that, different types of MetroCards could be issued to students, seniors, and workers like police and firemen with as many types of granular privileges as deemed necessary by the almighty MetroCard programmers. All this sounds great in theory, and in the 1990s, it must have sounded downright revolutionary. The only problem was that the MetroCards never worked so great. Anyone who’s ridden the subway in the past 30 years will know that the swipe experience itself tended to be more art than science. Swipe too fast, and the turnstile wouldn’t read the card. Swipe too slow, and the turnstile would’t read the card. Do this too many times, and you’d have to go see a station agent, some of whom are stationed a few blocks from any given turnstile. Fraudsters also quickly discovered technical flaws to exploit. Some found cards with money left on them, and sold swipes to unsuspecting tourists. Others devised a trick that involved bending empty MetroCards to enable free rides. 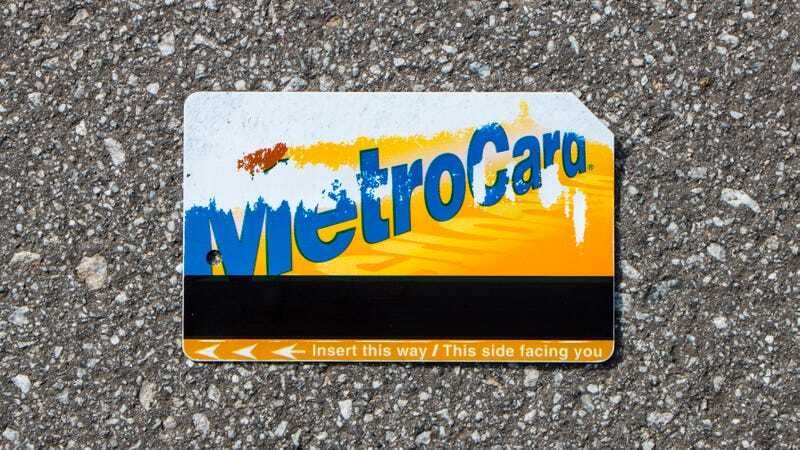 This trick was still in use nearly two decades after the MetroCard’s introduction. Still, the MetroCard model made enough sense for the MTA to keep it around longer than expected. One neat trick that the semi-disposable cards offered was the opportunity for display advertising. Starting in 1995, the MTA intermittently sold ad space on the backs of MetroCards. This left the gold and blue fronts untainted by corporate messaging but brought in a small trickle of revenue for the increasingly cash-strapped agency. However, different commemorative designs appeared over the years, featuring everything from New York City landmarks to sports teams. The MTA pulled out all stops in 2012, when it started to offer up the front of MetroCards to advertisers. “The whole thing is available, except for the black stripe,” an MTA spokesman said at the time. Within a few years, it was increasingly common to receive an ad-covered MetroCard, some of which even became collectible. The NYC-based skateboard brand Supreme launched its own limited edition MetroCards with its logo emblazoned on the back. Those quickly became collector’s items, fetching dumb sums of money on eBay. But everyone knew that the MetroCard’s days were numbered. London’s Oyster Card, which was designed by the same firm as the original MetroCard, launched in 2003 and offered a glimpse into the swipe-free future of public transportation. Riders just tapped the Oyster Card onto a reader at the turnstile and walked through. The same types of data collection took place, albeit with less hassle for the riders. Within a few years, Chicago and Toronto adopted similar systems. The MTA actually tested out RFID-based, contactless payment technology with Mastercard in 2006 and again in 2010. However, it wasn’t until earlier this year that New York began testing out the same tap-based technology that will now replace MetroCard swipes. It’s finally happening, though. New tap-and-go systems will be installed in 500 subway stations and on 600 buses by late next year. The technology will hit the rest of the stations and buses by the end of late 2020. The MetroCard will officially die in 2023, exactly 30 years after its birth. Riders will be able to use smartphones with software like Apple Pay and Pay With Google as well as debit cards and credit cards equipped with NFC technology to tap their way through turnstiles. This means riders won’t have to purchase tickets ahead of time but can buy them as they walk onto a train or bus in a magical-like way. It’s currently unclear if new NFC-equipped MetroCards will be an option as well, but that would make good sense. So after all this, the MetroCard might be reborn in a more sensible form. However, the original MetroCard, for all its perks, was never going to last forever. The technology was based on magnetic stripes in a world where cassette tapes were already being replaced by CDs. Doomed from the start, you might say. As MTA chair Joseph Lhotta told The New York Times, the new fare system is “the next step in bringing us into the 21st century, which we need to do.” It’s just typical that it took the MTA almost two decades into that century to make it happen.